Are you struggling with pooling water, grime and buildup around your sink? Tired of fighting with countertop crumb disposal? Undermount sink installation could easily deliver these cleaning woes with a one-two punch. Compared to their drop-in or over-mount sink competition, which rest atop the counter with a big lip, undermount sinks install from below. Though undermount sinks do have a rim, it remains invisible below the countertop, allowing for a smooth, continuous surface from countertop to sink. 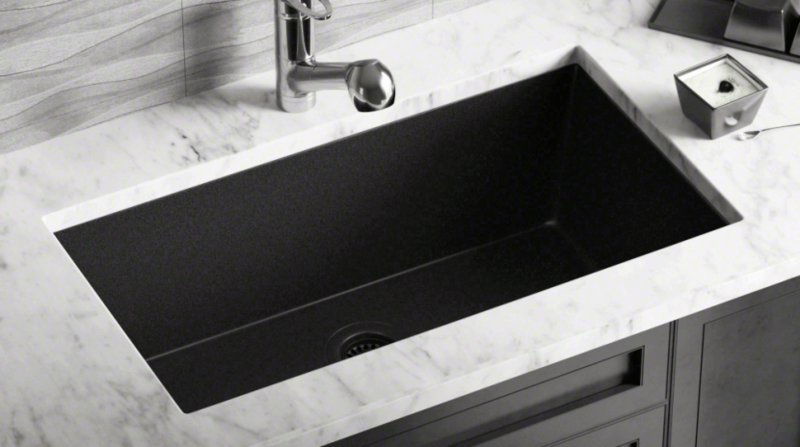 The sleek look of an undermount sink appeals to a growing obsession with seamless design. Banishing raised edges or lips atop the counter to maintain the smooth, uninterrupted lines of your kitchen design, undermount sinks provide a cleaner look – and cleaner function. Wipe food scraps right into the sink, add a bit more counter space, and step-up the look of your kitchen with this increasingly popular sink style. Not for lightweights, undermount installations require professional attention. Proper installation is crucial to avoiding headaches, later. Faucet and water lines must be installed first, or moved as necessary for attachment to the countertop or wall. Sinks should be installed not only with the right epoxy and silicone caulking adhesives, but also with clips or straps to ensure adequate support. (Imagine a sink full of dishes suspended only by caulk – BOOM!) In addition, undermount sinks require water-resistant, weight-bearing countertop materials: Granite, marble, soapstone, and concrete will work. Laminate, tile, or anything else on top of a wood or particle-board core will not work with an undermount sink. The inside edge of the hole through the counter is exposed and the water would interact with the exposed wood and both damage it and create unsanitary conditions. Can you have your old over-mount version swapped out for an undermount sink, given the right existing countertop material? It is theoretically possible, but unlikely – and risky. Hard surface countertops are typically installed with an adhesive that makes them next to impossible to remove in one-piece. If you were to remove the sink without damage to the counter, you would then find a ring of adhesive residue that’s difficult to completely remove. You would either need to live with the ring, replace the counter, or re-install the drop-in sink. Also, going back to the original installation, if they knew the plan was to install a drop-in sink, it’s quite possible the inside edge of the hole through the counter is unfinished (not polished) and this would be another reason to bail on the conversion from a drop-in to undermount configuration. Pro Handymen completes hundreds of repair, maintenance and improvement tasks throughout homes and businesses. Emergency! My House is Humid and Musty!